All meetings will take place on Mondays, from 12:15–2 pm, in CGIS South S050, 1730 Cambridge Street, unless otherwise noted. Sandwich lunches are provided. Please RSVP to via the online form by Wednesday at 5PM the week before. The STS Circle at Harvard is a group of doctoral students and recent PhDs who are interested in creating a space for interdisciplinary conversations about contemporary issues in science and technology that are relevant to people in fields such as anthropology, history of science, sociology, STS, law, government, public policy, and the natural sciences. We want to engage not only those who are working on intersections of science, politics, and public policy, but also those in the natural sciences, engineering, and architecture who have serious interest in exploring these areas together with social scientists and humanists. There has been growing interest among graduate students and postdocs at Harvard in more systematic discussions related to STS. More and more dissertation writers and recent graduates find themselves working on exciting topics that intersect with STS at the edges of their respective home disciplines, and they are asking questions that often require new analytic tools that the conventional disciplines don’t necessarily offer. They would also like wider exposure to emerging STS scholarship that is not well-represented or organized at most universities, including Harvard. Our aim is to try to serve those interests through a series of activities throughout the academic year. 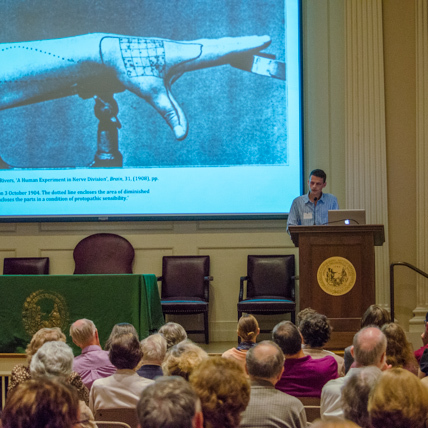 Simeon Koole, William Alexander Fleet Fellow at Princeton University, describes "Changing Conceptions and Experiences of the Sense of Touch in Britain, c.1870-c.1970" at the Introductory Symposium. Philadelphia, September 2013.